Tibetan Covers: Gorillaz, Roots and Gaga! It’s always fun when you hear a contemporary Tibetan pop song and recognise the tune from elsewhere. Like when I was watching Made in Tibet by Shapaley and my friend recognised the plinky plonky piano part being from the film “Amelie”. The word on the street now is that there is a Shapaley remix going round that takes a sample from “Let Me Blow Ya Mind” by Eve featuring Gwen Stefani, want to hear that! I just wanted to share a few songs from Tibet that I’ve come across that sample some cool tunes! 2. Someone sent me this song by Lhasa’s Tibetan Mastiff Crew a while back and it samples “You Got Me” by The Roots featuring Erykah Badu! I can’t find a video or anything for this song so I’ve uploaded the mp3, the lyrics in Tibetan (and English) are pretty nasty, there’s also a little bit in Chinese. 3. This last one is a straight-up cover of Lady Gaga’s “Bad Romance” but with Tibetan lyrics and a rather, er, unique singing style. I’ve put this up on my blog before but I’m not really sure that people liked it, at least most of my friends don’t seem to! Anyway here it is again! Does anyone know any more covers or Tibetan songs that sample contemporary pop music? Let me know! 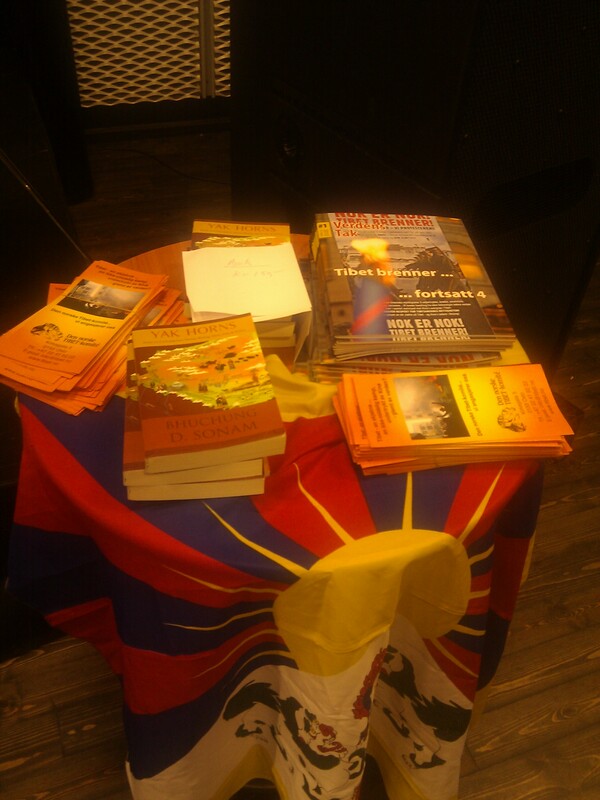 Our little book stall at the festival during our event! Last weekend at the Bjornson International Festival of Literature in Molde, Norway, was educational, interesting and also a lot of fun. I met the wonderful writers in exile, Philo Ikonya (Kenya) and Asieh Amini (Iran) and got to know about the important of work of organisations such as The International Cities of Refuge Network. My hope is that everyone went away with a renewed sense of energy to raise awareness about the plight of Tibetan cultural figures. Furthermore, I also hope that we got people interested in Tibetan cultural output in general, in writings, music and poetry. Highlights were Philo’s reading of Tsundue’s poem “My Tibetanness” and the concert on the closing night which I really enjoyed. A huge thank you to the organisers of the festival, everything was perfect!